This cinnamon-scented blueberry French toast casserole could also be called a breakfast bread pudding. Or, serve it with a scoop of ice cream or a vanilla sauce for a delicious dessert. Use fresh blueberries in the recipe, or use frozen. If you do use frozen, don't thaw them first. The recipe makes its own syrup topping, but you might want to serve it with extra syrup. Butter a 2 1/2-quart or 3-quart shallow baking dish. In a small saucepan, combine 1 cup brown sugar, the butter, maple syrup or corn syrup, and cinnamon. Bring to a boil, stirring frequently. Boil for about 2 minutes, or until the sugar has dissolved melted. Stir in the 1 teaspoon of vanilla. Pour into the prepared baking dish and spread to cover the bottom. Sprinkle about half of the bread cubes over the syrup layer, then sprinkle the blueberries over that layer. Top with the remaining bread. In a large bowl, whisk the eggs, milk, 1 1/2 teaspoons of vanilla, and granulated sugar until well blended. Pour over the bread and blueberries. Press gently so all of the bread is coated. Cover and refrigerate overnight. In the morning, combine the 1/4 cup of brown sugar with 1/2 teaspoon of cinnamon. Remove the French toast mixture from the refrigerator and uncover. Sprinkle with the brown sugar and cinnamon topping mixture. Bake for 1 hour to 1 hour and 15 minutes, or until the custard has set. A knife should come out clean when inserted into the custard. 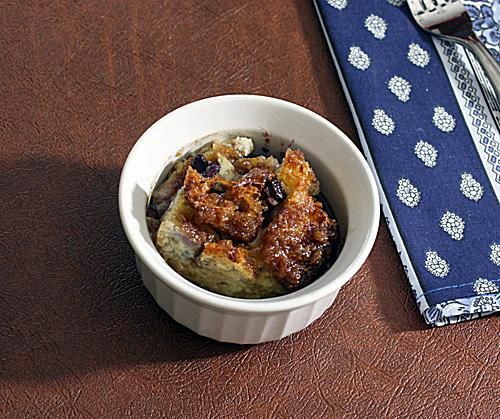 Cut the bread pudding into squares to serve. Serve with extra maple syrup for a breakfast or brunch dish, or serve with a vanilla sauce and a scoop of ice cream for a dessert. If you're using a rather sweet bread, you might want a bit less sugar in the egg mixture.